Give us a call to find out what Stamped Concrete Colors we have in stock. Including a decorative aspect to dull grey concrete is a hot trend today. Numerous home builders, designers, company architects, professionals and owners recognize distinct and customized ways to include design and color to their concrete projects. Ornamental Concrete ideas and designs are popular on concrete patio areas, concrete floors, concrete counter tops, concrete furnishings, concrete pool surrounds, sidewalks, paths, vertical concrete walls, and more and consist of applications such as: acid stained, stained or colored concrete, polished concrete, concrete overlays, concrete engraving, stenciling interior floors, resurfacing concrete, exposed aggregate, stamped concrete, imprinted concrete, vertical stamped concrete, concrete counter-top surfaces, and ornamental faux designs. ​Decorative concrete has emerged as a top choice for many because of the improvement from dull grey concrete to stunning decorative aspects. The benefits to making use of decorative concrete in you next project may include: expense, custom-made design, adaptability, durability, performance, and also allows for each individual to include their own special concepts into the design aspect. 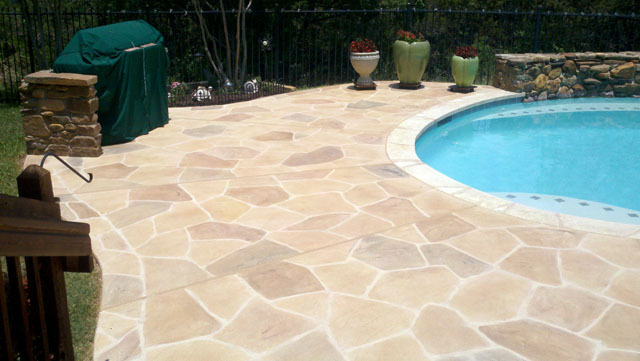 ​Stamped concrete that is normally referred to as imprinted, patterned concrete. This is one of the initial decorative concrete approaches to include a pattern or structure into a freshly positioned concrete piece. Some of the popular uses for stamped concrete are on Patios, Driveways, Pool Surrounds, Vertical Walls, Stairs, Entryways, and Porches. ​Because of it's versatility, concrete allows for a best canvas to create a look and feel of a high end product while maintaining an unique, natural feel. ​When decorating a residence, there are lots of various methods that this can be done to make it appealing. One of the most efficient methods of ensuring that your home is decorated well is by utilizing stamped concrete. This type of decor adds excellent value to your home, providing it an opportunity to quickly appreciate in value and making it very pleasing to the eye. ​Stamped concrete is a very affordable type of design whether it is an indoor or outdoor residence decoration. This is primarily due to the fact that it just involves using plain concrete, which is then completed by creating textures and patterns before the plain concrete is dry. Many different looks can be attained by the use of stamped concrete. The very best thing about it is that stamped concrete is cheaper compared with other structure materials such as stones and bricks, though the end result is virtually the like with those other costly products. ​It is possible to add an accent color to this concrete treatment. There are also many shapes and structures that you can choose from depending on where you are using the concrete. ​Stamped concrete that is typically referred to as imprinted, patterned concrete. This is one of the original decorative concrete methods to add a pattern or structure into a newly placed concrete piece. Many different appearances can be achieved by the use of stamped concrete. It is possible to include an accent color to this concrete treatment.